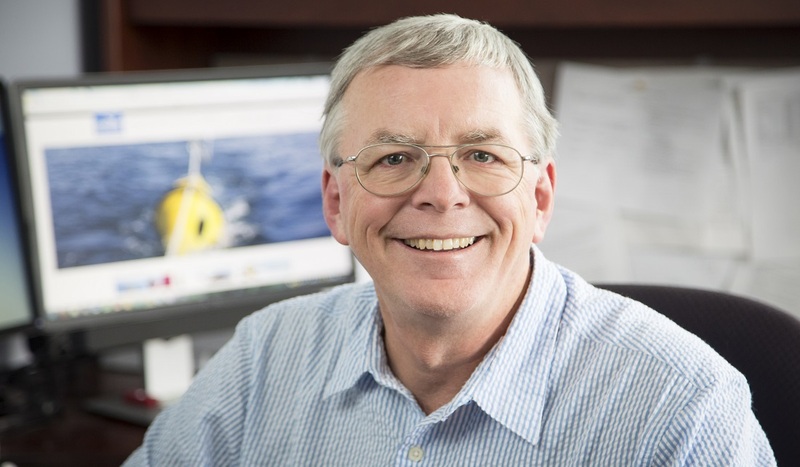 Brian Miller has been director of the Illinois-Indiana Sea Grant program for 10 years. He retired on February 1, 2018, as the program administration transitioned from the University of Illinois to Purdue University. Below is an interview from his final days with IISG. What is your history with the IISG program? I started back in 1994 as the extension program leader.  The program began at the University of Illinois, and in 1994, it came to Purdue when the university asked for the opportunity to take a shot at running the administration. At that time, IISG was very small. There was no research program, the director, Phil Pope, was from Purdue’s Department of Forestry and Natural Resources. We got the research program reinstated, and in 1997 we achieved college status. In 2001, when Phil Pope retired, the two universities agreed that it would move to the University of Illinois to report to the vice chancellor of research. Then, in 2007 I was hired as the director. When I was getting ready to retire, the same discussions came up that happened back in 1994 and in 2001. We’ve again decided to move the program to the partner university, so, we’ve really come full circle. The difference is that when it came to Purdue the first time, there were four people, one specialist, and a budget of about $300 thousand per year with no research. And nobody really knew who we were or what we did. It was hard to become a partner in a big place like Chicago. People in the universities didn’t know what to do with us, and people on the coast didn’t know what to do with us. It was just a small program. Today, the program is coming over to Purdue with 18 specialists and more than 175 partners. I think the big thing that’s changed is that we no longer have to walk through the door and explain what we do, and we don’t have to try to convince people to work with us. In a lot of cases, it goes the other way, where we’re asked to help participate and solve problems. We’re seen as a program that can bring science and expertise to bear on tough community, state, and regional resource issues. And that really was the dream initially. So, I think that provides a pretty good platform for moving forward with the next administration. What have been IISG’s greatest impacts during your time as director? I think one of the things that we’re known for nationally is that we help local communities with planning, whether it’s watershed planning, land use planning, sustainable water planning, or thinking about planning for hazards and how to be resilient so we’re not more susceptible to flooding. We try to make sure that everything we do helps somebody make a decision—about management or policy or even personal decisions—that balances their goals with what’s best for the coast. I’m pretty proud of the connection we’ve made between universities and communities. Researchers now have the ability to take their results and, instead of just depositing them somewhere like publications or the library, they can incorporate them into a decision support system that communities can use. Three great examples of that are GreatLakesMonitoring.org, Tipping Point Planner, and Great Lakes to Gulf. 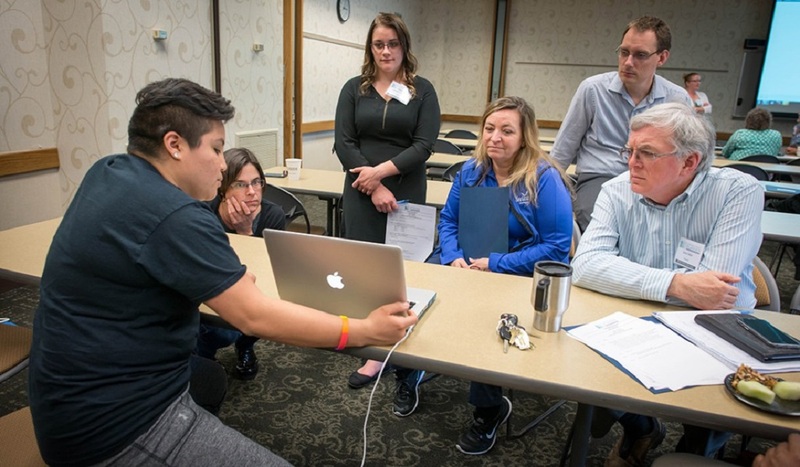 Brian Miller, right, listens as Purdue University graduate student Valeria Mijares talks about research on comprehensive indicators of water quality. Seated from left are Sherry Martin, research associate, Michigan State University, Danielle Gerlach, Michigan Sea Grant intern, Mary Bohling, extension educator, and Dan Walker, IISG community planning extension specialist. The last big project I got involved with was the Illinois Nutrient Loss Reduction Strategy. That was one of the most challenging projects, but it was also the most rewarding. I was asked to help facilitate the process to develop and implement a nutrient loss reduction strategy in Illinois. The Illinois Water Resources Center and IISG really work together on this. I am proud of facilitating a policy workgroup, made up of a wide array of stakeholders that were able to come together and develop a solution. We had seven workgroups, and in two years we were able to publish the Illinois Nutrient Loss Reduction Strategy. Last August, we released our first biannual report that demonstrated big changes in land use practices and best management practices along with a scientific report that showed a reduction in the loss of nutrients in the state. It was really rewarding to see people coming together to solve problems, and willing to try and make sure they’re protecting the water and the environment we all share. That experience was kind of a capstone that brought together all of my experiences and knowledge during my time with Sea Grant. What has it meant to you to be part of the Sea Grant network? When I started in 1994, the very first meeting I met my peers at other Sea Grant institutions, we just all immediately became friends. Through my whole career, that feeling never changed. There were often national competitions for money or national research competitions where we could’ve easily become competitors and fought with each other, but we never did. In the Great Lakes, there’s been a long tradition of networking and partnering. Something I really appreciate from the Sea Grant network is that we are all based at the core in university science. We start with the facts. We may have different ideas of how to get there, but we’re able to find a way to do it together for the greatest impact. Over the years, the focus has shifted from “How many pubs did you create?” to “So, what did it do? How was it used? Did the environment change because of what you did?” That was a very different way of thinking, and I think Sea Grant was one of the leading agencies and groups to embrace that. One of the coolest things that I got involved with was creating the Sea Grant Academy. Up until the late ‘90s and early 2000s, there was nowhere to learn how to focus on impacts, to learn how to plan new programs, and to get the ethos of what a good extension or Sea Grant program should really be. And so, we decided to develop an academy. It’s been conducted every two years since then. After our third academy, 10 percent of all the program leaders were academy graduates. And I think that number is higher now. Two of the cornerstones of academy training is how to design programs for impact and to learn how to report to Congress and your state legislators and communities with demonstrated impacts. And I think that’s just a philosophy that always gave purpose and meaning to me personally. That seems to be the philosophy that drives Sea Grant, and I think that’s what being part of that network has meant to me. What will you miss most about being involved with IISG? The people. The thing that has always been so special about Sea Grant is the people. There’s an old cliché and you hear it a lot: “We’re like family,” but it really is like that with IISG. There is always a cooperative spirit. We all work together. It doesn’t matter that we work in separate states. It doesn’t matter that we have different universities. It doesn’t matter that, in all other aspects, we would be competing for resources. But because we are part of Sea Grant, we work together, we get credit for working together, and we know that we’re stronger for doing that. 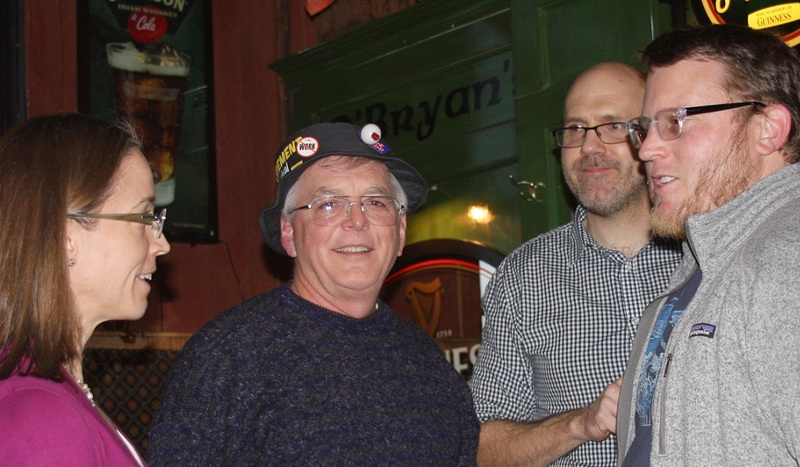 IISG staff members, Kristin TePas and Tomas Hook, and former IISG employee, Jarrod Doucette, reminiscing with Brian Miller at his retirement party. We respect each other as colleagues and friends. I’ve appreciated that throughout my entire career. It’s added a lot of value to my memories, my career satisfaction, and everyone I’ve gotten to know has added to my perspective of how I view the world and how to operate in it. That’s something that I’ll really miss. You don’t get that in every career. What are your plans after retiring? I grew up in southern Indiana. Both my grandparents farmed. I was raised as a kid spending all my summers on the farm, and that’s where I got involved in wildlife and forestry and water resources. Then, I came to Purdue and got a degree and became a wildlife biologist. I worked in Connecticut as a wild turkey and small game biologist and then came back to Purdue to work as a wildlife extension specialist. I started to realize that just working on wildlife habitat wasn’t good enough–I realized that if we weren’t working with land use planning, we weren’t going to solve any problems. Then Sea Grant really helped me broaden into water, fisheries, and coastal issues. So, I went from being a specialist to being a generalist really. But toward the end of my career, I also got involved in farming and nutrient issues. Now, as I retire, I’m going back to the farm that’s been in my family for 150 years, and it’s got a house on it that was built in 1905. I’ve added wetlands, and I have short grass prairie and tall grass prairie. I have mature woodlands, and I’ve planted bottom land hardwoods. And now, I have the chance to put a lot of what I’ve done and learned back into practice with my own hands again. In a lot of ways, it’s all kind of come full circle. * This interview has been edited for brevity and clarity.